In Fly Cape Town Paraglidings case, an immaculate feature is the outstanding tandem paragliding Cape Town experience that it offers. It would be safe to say that no other paragliding firm comes anywhere close to the kind of experience which Fly Cape Town Paragliding is able to offer to patrons, that too on an absolutely consistent basis. Feel free to peruse our reviews on Tripadvisor. At the heart of this brilliant facet in Fly Cape Town Paraglidings case is the very high quality of pilots that it has. They have all undergone rigorous training over a number of years and only then arrived at a stage where they are able to fly tandem with patrons with ease. This high quality is something which is not merely confirmed by word of mouth but actually ratified by the South African Hang Gliding and Paragliding Association that duly licenses us (a mandatory requirement as per the Civil Aviation Act anyway). Therefore, with regard to the quality and reliability of pilots that we have onboard, you can be reassured beyond the slightest hint of doubt. Further, you also need to look at the outstanding vantage points which we have chosen for our paragliding Cape Town sessions. Typically, we take off from Signal Hill or Lions Head, both of which are remarkable locations that offer an exhilarating view of the entire Table Bay shore and indeed the whole of Cape Town city. No other experience offer the kind of views which we are able to ensure on our paragliding sessions. After all, here you are remarkably close to the land area, to at least be able to discern from above the view below, while still having the same experience of wafting through the air as you would were you to fly by yourself. 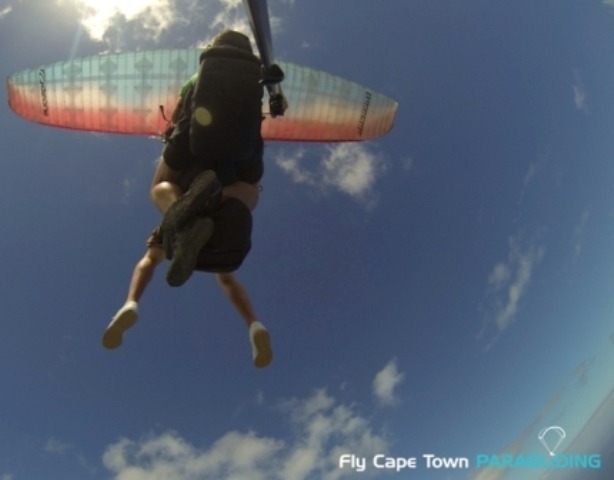 A final note also needs to be made about the paragliding equipment that we deploy here at Fly Cape Town Paragliding. Strictly following industry norms, we use only the very best paragliding equipment available, not only as per local South African standards but internationally whereby you are assured of safety and security which is second to none on a global scale. All of these factors together have put us at a pedestal where we are clearly a force to reckon with as far as tandem paragliding in South Africa as a whole and Cape Town in particular is concerned  so why not come down and experience firsthand the enthralling experience that tandem paragliding with us has to offer?